How about getting to know great products of New Zealand? Sounds simple but we all know the way you start the morning can affect your whole day. If you learn how to start your day right it will significantly increase your chances of having a satisfying, productive day! I know it’s hard enough to wake up in the early and dark morning but try to start your day with a boost of energy from a refreshing shower. When life gives you lemons you make handcrafted scrub out of it: Aio Sugar Scrub Lemon. 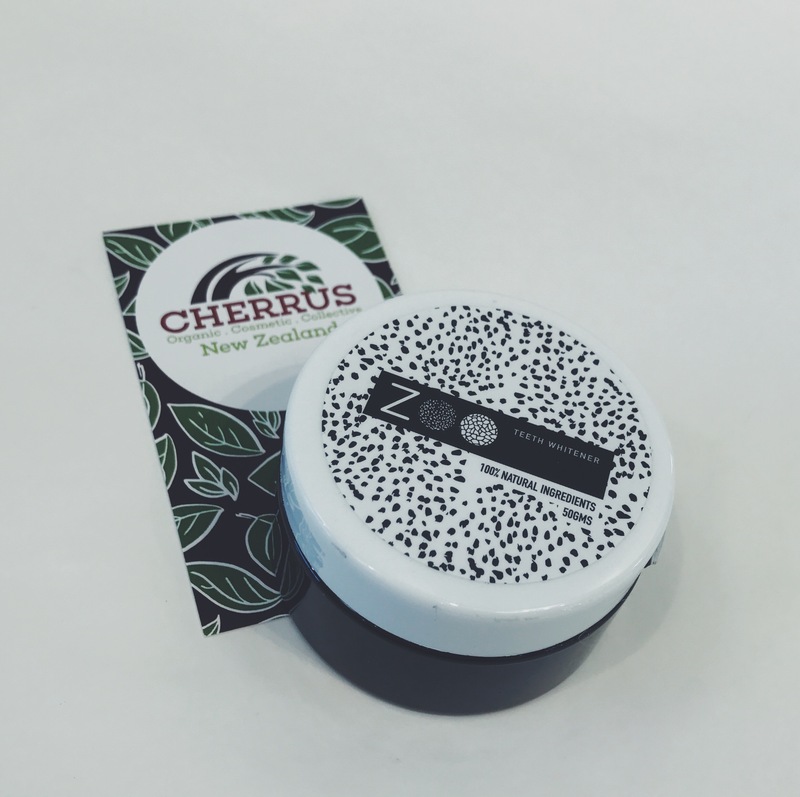 This magic mixture of coconut, olive, almond and rosehip oils that I found on cherrusnz.com will boost your circulation in the morning, get your blood flowing and wakes you up quicker. You don’t want to carry sleep on your face the whole day so definitely use Astral Collective Zen Activated Sponge. 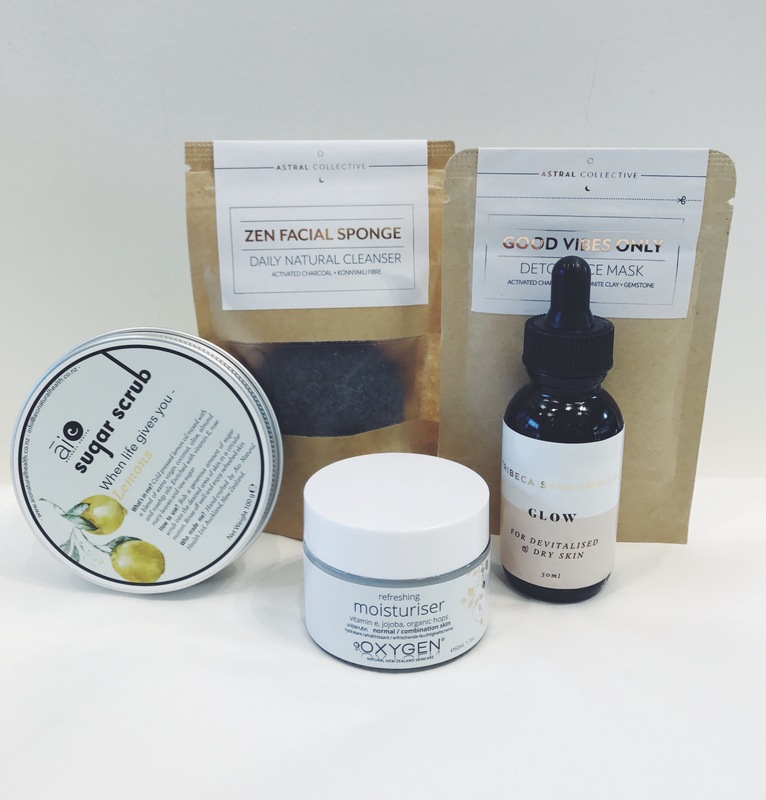 I love that cheeky little sponge because it contains only two ingredients: activated charcoal and konnyaku potato fibre but gives my skin a clean and healthy feeling in just 1 minute! Another deep cleanse alternative is Astral Collective Detox Face Mask although I’m impatient and prefer to use that one in the evening so I can lay down and wait until it’s dry. Nevertheless 1 spoon of this powder mixed with a bit of water works miracles! Oh yeah and the packaging is tiny and cute! Moisturising your skin is an important part of every bath ritual especially during the cold days. Worth to mention that showers shouldn’t be hot either: The more heat, the more moisture is drawn from your skin. It’s hard to find good face creams, prices and brands don’t mean good quality nowadays. I doubtlessly recommend natural-derived Oxygen Refreshing Moisturiser and Tribeca Glow , it just depends whether you prefer oil or cream. After your beautiful morning routine leave your house with the perfect smile! I’ve tried the new natural and cruelty-free Zoo Natural Teeth Whitener to whiten and polish teeth. I really liked the result. I need to inform you though, it won’t work immediately but if you use it every day you will notice the difference! It’s a bit of a messy procedure but will definitely give you that million dollar smile! During the winter, it’s especially important to get your daily dose of fruits and veggies to help maintain a strong immune system to battle all the colds and flu’s going around. Blended smoothies are an efficient way to pack a ton of nutrition into glass. Nevertheless we don’t always have time to search for various recipes and buy fresh products in our busy lifestyle. 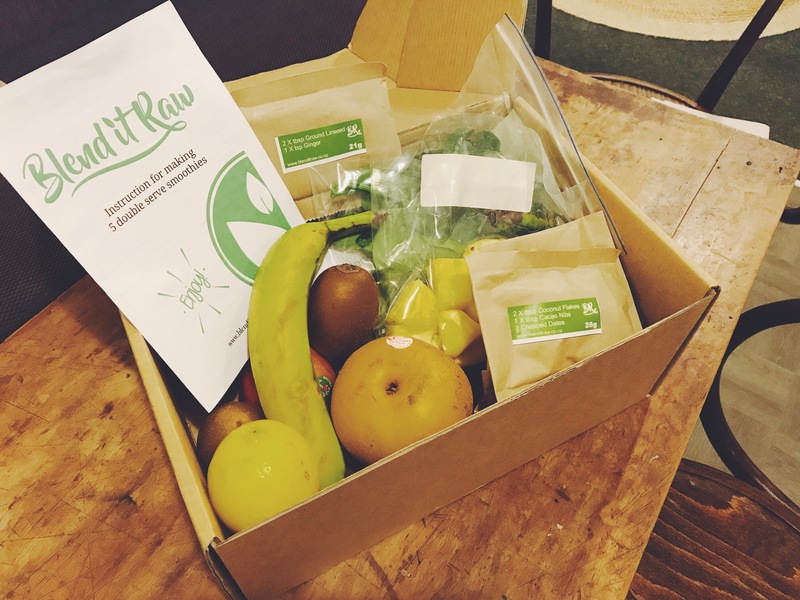 Blend it Raw makes it very easy to be healthy and save some shopping time with their idea to deliver chilltainers filled with ingredients for 10 portioned servings direct to your home. They offer free shipping, everything that they send is recyclable and there are 3 new recipes every week! With the exact amount of products you won’t experience any waste. The amazing aspect about Blend it Raw – recipes is that they describe why the ingredients of each smoothie are important for you. Additionally it’s easy to follow them: Just throw the mentioned ingredients into the blender and Voila! The energy booster in your glass is ready! It’s the most effortless and effective way to stay healthy, energetic and avoid to gain weight during those cozy peckish winter nights at home. P.S. Worth to mention, they regularly publish new delightful smoothie recipes on their website! The best escape from the rainy cold weather is by soaking in a hot bath and relax that winter blues away. You don’t have to go to a pricey spa, you can have the same luxurious experience in your own home and without spending a fortune. You just need to possess a bath and visit the beautiful website donoharm.com . There you can find various natural and cruelty-free products for affordable prices. 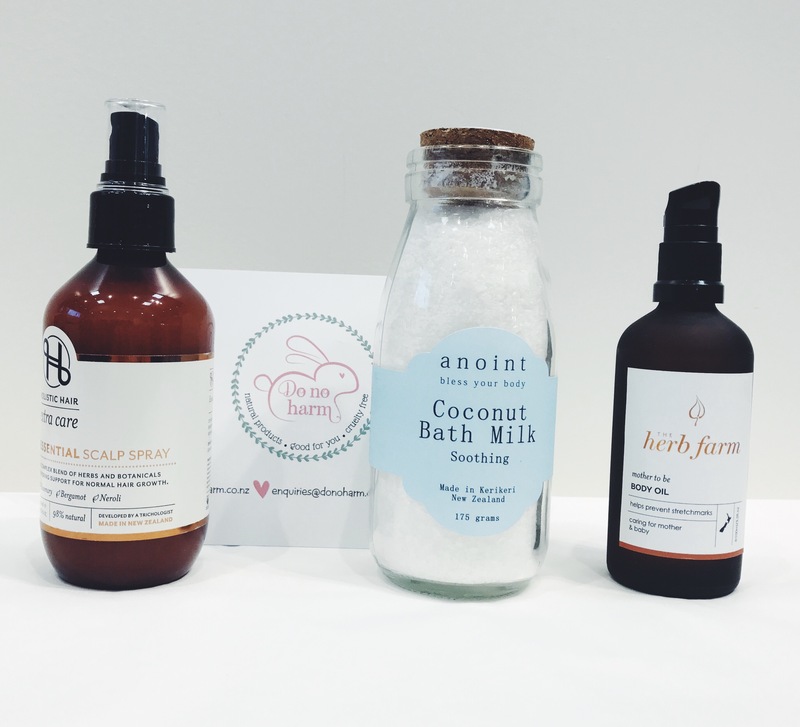 Try Anoint Coconut Bath Milk and immerse into an exotic heaven with the smell of coconut and essential oils. And the way the bottle with the cork lid looks is adorable! Winter times can also cause dry scalp and slows the growth of your hair. But where there are problems, there are solutions! I’ve discovered Essential Scalp Spray which helps to support hair growth and scalp circulation. It also contains Lavender oil that helps to alleviate dryness and inflammation. It’s simple to use, just spray it directly onto the scalp, there is no need to wash it out. You can use it daily, it’s up to you! Furthermore all us girls want is for our hair to grow fast and strong even if it’s not winter! Future mummies need to take even more care of their skin because of going through the big changes. There is a great range of numerous oils and creams to prevent stretch marks and relieve the feelings of itchiness. One of them is Mother to be Body Oil which is 100% natural and it’s safe for mother and baby. For just $30 you will receive an amazing mix of almond, avocado, wheat, lavender and carrot oils that you need to massage into your skin once a day. The success lies in taking care of your beautiful body! Best time for a tea party! What is a better way to spend a cold winter afternoon than enjoying a cup of delightful tea with your favorite friends? Especially during this winter season’s relentless low temperatures that leave you frozen to the bone. There’s no solution more immediate and enjoyable than a hot cup of good tea. You can surprise yourself and your cherished ones with the Himalayan experience from Nepal. 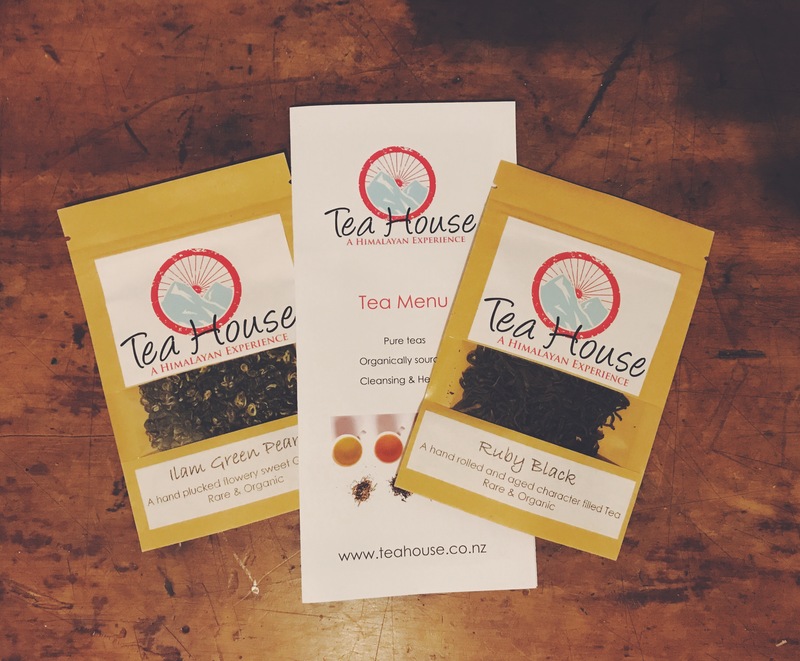 It’s ideal for black and green tea lovers who enjoy rich and strong flavors. I’ve ordered the 10 gram tasters from Tea House and found my favorite one: Ruby Black. With time our skin gets thinner and dryer, furthermore it’s getting more susceptible to damage through the cold temperatures and wind. Especially the area around our eyes is very sensitive to surroundings and different lifestyle habits. We all know that eyes are the windows to our soul, that’s why we need to keep them happy and vibrant! Saintsco Bee Venom Eye Cream is my favourite at the moment. I prefer to put on eye cream in the evening because it’s easier to apply my make up on the next day: No panda eyes after using mascara. 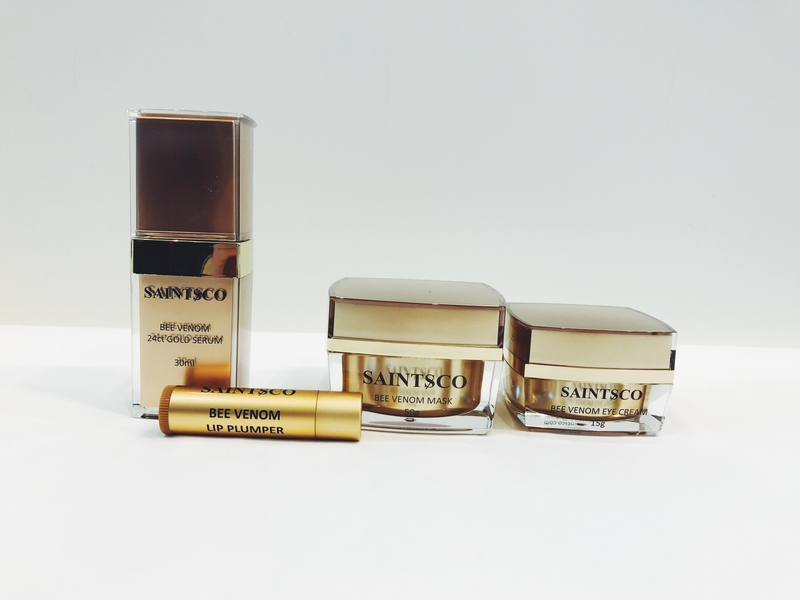 Most eye creams made my eyes look swollen the next day but not Saintsco . It’s quickly absorbed by the skin, additionally it tightens and lifts the eye area. Great anti-aging and moisturizer. And again regular moisturizing is definitely good to prevent any unwanted conditions such as dryness and wrinkles during the colder periods. I discovered the unique Saintsco Bee Venom Mask and was amazed what it’s done to my skin. I have a normal skin type and use it just once a day in the evening and it makes my skin soft and healthy. It contains bee venom that’s known as as a painless alternative to botox, that means no needles needed to look beautiful and fresh! Nevertheless some people might be allergic to bee stings, just make sure that you are not one of them if you want to experience wonders of Saintsco. Another Sainsco product that I adore is Bee Venom Lip Plumper . Surprise, surprise it makes your lips bigger in a natural way! The bee venom will give you a bit of tingling feeling in the beginning but it takes just 2-3 minutes and as a result you will have voluptuous lips. The combination of manuka honey and shea butter will nourish and soften the lips. Furthermore it’s possible to wear it under your lipstick! 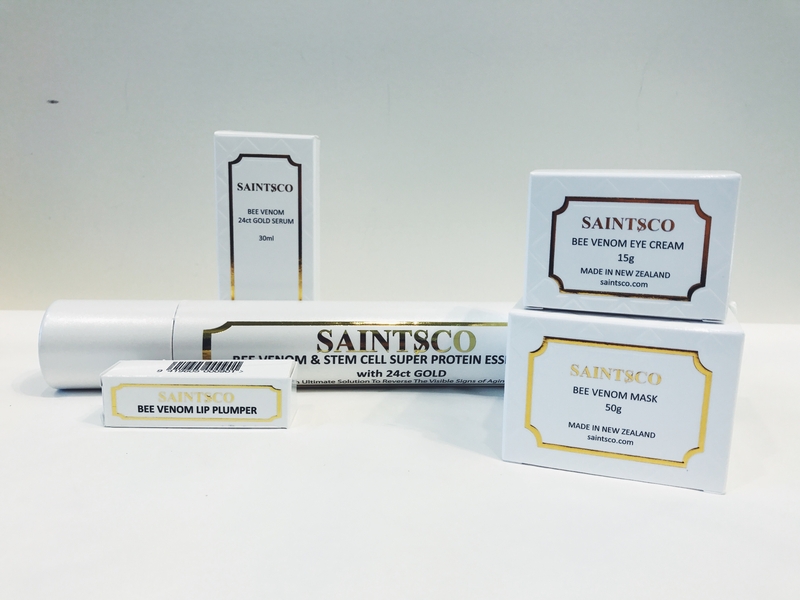 When it comes to keeping the skin look young, no beauty ingredient does a better job than two of my beloved Saintsco products: Saintsco Bee Venom 24ct Gold Serum and Bee Venom & Stem Cell Super Protein Essense with 24ct Gold. In the winter and for those who are working indoors where the skin is under the influence of conditioned air all the time moisturizing and hydration are essential. Both of these incredible products are suitable for all skin types and help you to combat the signs of aging. Serum helps to increase blood circulation, soften your skin and gives a bit of a shiny effect because of the gold powder in it. It’s a marvelous way to spoil yourself and boost elasticity, correct skin, reduce wrinkles and emphasize your youthful appearance. Furthermore all products are from New Zealand and it contains 100% pure natural bee venom. Definitely a winter must have! While winter is spreading it’s cold all over the country, we instinctly feel an urge to create our warm nests during the season. The sheepskins are the best way to give that feeling both visually and sensually by their soft surface. Did you know research reported that sheepskin has a soothing, swaddling effect that can result in better sleep, reduced stress and improved weight gain. Furthermore you can use them in different ways by lining the chairs, covering the beds, placing onto the floors or just using them as throws at any place easily. Or just get some warm and soft slippers to keep your feet warm throughout any bad season times! During the cold temperatures it’s important to take care of your beloved one. And who has the tendency to forget about essential daily procedures? Right, men! The best way to solve that problem is to surprise him with great products. Furthermore giving presents to others stimulates feelings of kindness, compassion and love. I would suggest Mens Refreshing Pack from KDone. It’s all made in New Zealand and includes shaving gel, aftershave balm, body wash, aluminium free deodorant and lip balm. The products may have a bit of a specific smell, it’s because they are 100% natural and don’t have added fragrances that cause sensitizing and other negative skin reactions. You will be positive surprised about the result and smoothness of your partner’s skin! Additionally it’s packed into a useful travel bag that can be used if you want to escape cold weather and fly away to a sunny paradise. You need effective travel products for yourself as well? 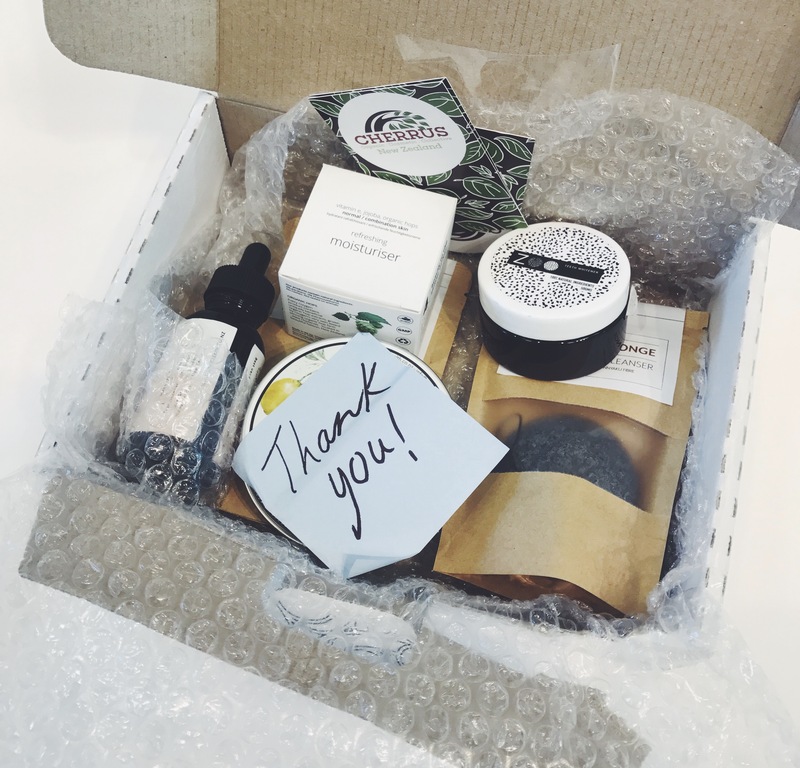 No worries, here is a lovely Skincare Pack with moisturizing goodies. Facial cleanser with the refreshing smell of lemongrass is perfect to remove make up and clean your face. There are two different types of moisturizers: light hydrating and rich& intensive for mature skin, it’s also great to use as a night cream. 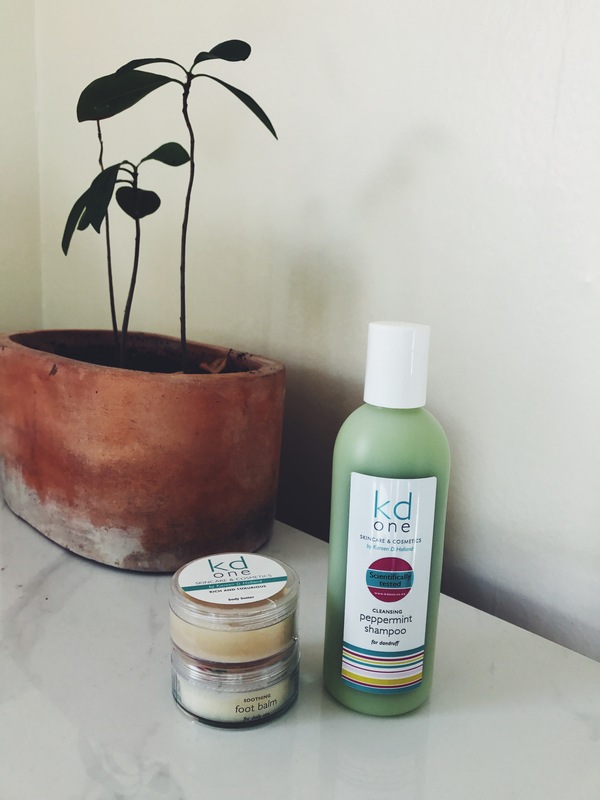 Last but not least; Hand & Body cream to spoil your skin with avocado oil and vitamin E.
My two other winter must-haves from Kareen Holland’s collection are Foot Balm and Peppermint Shampoo. We tend to forget about our feet in the cold season because they are covered most of the time. But wearing shoes the whole day will cause dry skin and other discomforting reactions. It’s crucial to use foot balm rich in effective hydration and moisturizing. KDone’s with avocado oil, shea butter, cocoa butter and other essential oils is doubtlessly one of these! Use it over night and you will wake up with baby skin on your feet. As I mentioned before dry scalp is another unpleasant issue that winter can bring. And while it’s not snowing on the North Island, you won’t be able to get away with the “Snowflakes in my hair” joke. Most of the shampoos nowadays contain numerous amount of harmful ingredients, KDone Peppermint Shampoo is absolutely natural. It will sooth your scalp, stimulate blood circulation and makes your hair pretty! It’s undeniably worth the money! Just Be Natural with soaps! As I mentioned the seasonal attack of biting wind on our skin and hair leaves us with a dry and uncomfortable feeling. 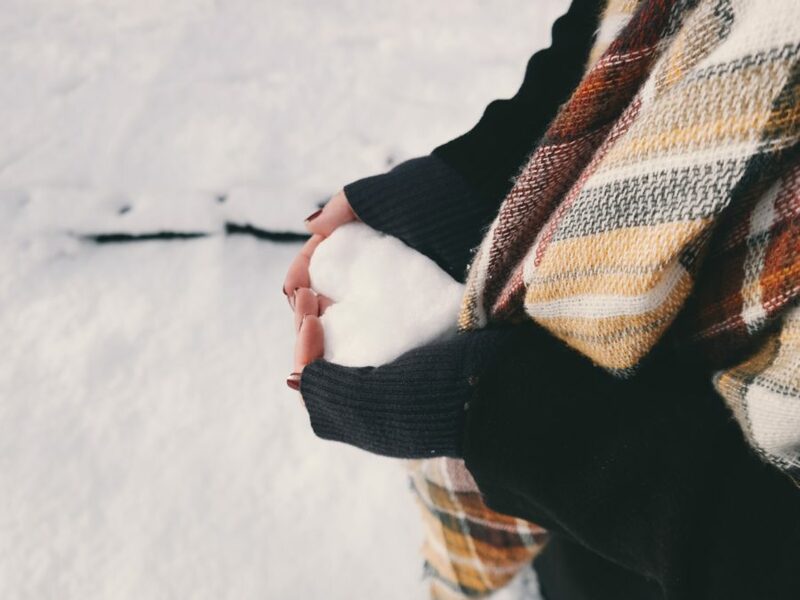 The keys to radiant skin in the winter time are using natural products that work with your skin’s own oil-producing system, protecting skin (and hair) from the harsh elements. 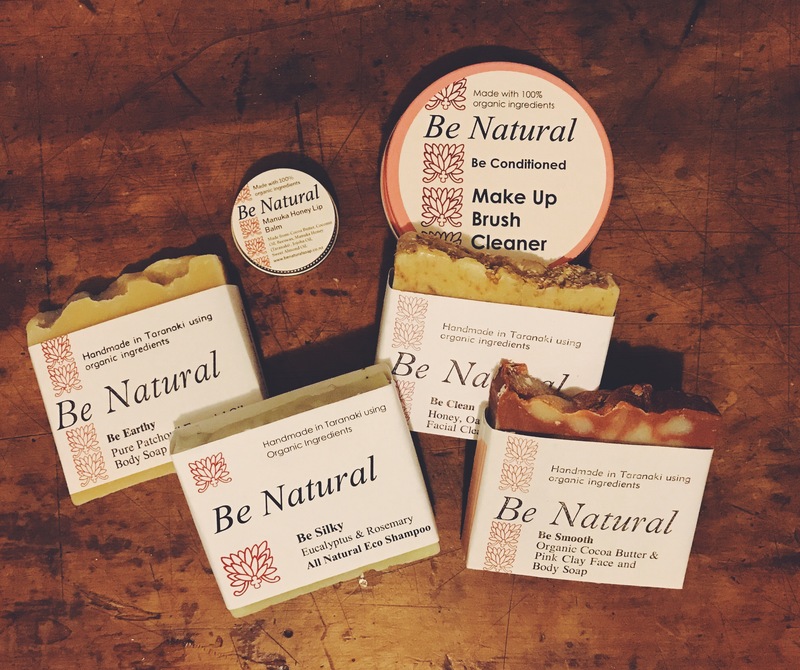 I discovered New Zealand’s Be Natural soap products and was amazed by the great results you can reach with it! Facial skin is sensitive and delicate, but takes quite a beating in terms of exposure to weather, chemicals and other external influences. Furthermore we forget that cleaning our makeup brushes regularly is important. Not only will it get rid of bad bacteria, but it will also prevent your makeup colors from getting mixed. That’s why Make Up Brush Cleaner is one of my favorites. Afterwards you can use Be Clean – Honey, Oat And Almond Face Soap For a gentle, natural cleansing use. It smells like caramel and can be also used as a baby soap, body soap and is fantastic for men’s shaving. Be Silky is an organic shampoo bar with Rosemary and Eucalyptus. I’ve never used solid shampoo before and to be honest I was skeptical. But the results are amazing, my hair smells good and it looks shiny and healthy! What else do you need? Online you can find various soaps which will make every beauty junky happy and excited. They are all just $8!